Australia’s original national Aboriginal Art Fair will be held in Darwin from 13 – 15 August. The 2009 event has attracted a record 32 Indigenous owned and operated art centres from as far as East Gippsland in Victoria and the Torres Strait Islands. Janice McEwen, Director of Top End Arts Marketing, the organisers of the Art Fair, says this year’s Fair, the third since it commenced in 2007, will showcase a wide range of artworks. “Through our research, Top End Arts has learnt how much visitors to the Art Fair appreciate being able to see and buy such a variety of work in one place, so we’re very excited about the 19 new organisations joining us in 2009. 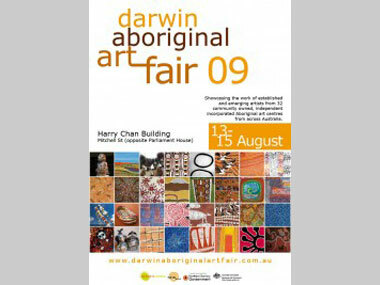 “We’re also very proud Darwin introduced the Art Fair as the first national event of its kind. The Darwin Aboriginal Art Fair has become a major industry event, attracting national and international galleries and dealers keen to see work of established and emerging artists coming out of art centres. It is also an opportunity for visitors to meet the artists, and for artists to meet and see each other’s work. Senior artist Regina Pilawuk Wilson* from Durrmu Arts in Peppimenarti is a big supporter of the event. “The Fair last year was really good. We got to represent the community and meet other artists and centres. I met ladies I hadn’t seen in years. We really enjoyed ourselves. I saw the people looking at my work and buying it, which was good,” Ms Wilson said. 2009 Co-ordinator, Ali Copley, says the new venue – the Harry Chan Building next to Parliament House – sits well with the city spaces that are part of this year’s venues for the Darwin Festival. “The Art Fair promises be a truly remarkable event,” Ms Copley said. “With over 30 art centres under one roof, many from very remote areas, visitors will have a unique opportunity to buy some beautiful work - from acrylics on canvas and barks to limited edition prints, carvings, fabrics and jewelry, there will be something for every taste and budget. “You’re purchasing direct from the artists. And there’s also a good chance of picking up artwork from a NATSIAA finalist,” Ms Copley said.